Loving aunt and friend passed away Thursday, March 29, 2018 at New Hope Assisted Living. Age 95 years. 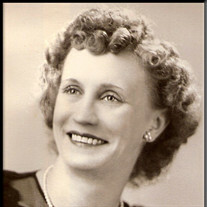 Daughter of the late Lewis and Agnes (Strozewski) Peplinski, Regina was born August 14, 1922 in Maple City, Michigan. She was married to Floyd G. Bailey on January 31, 1953 at Immaculate Conception Catholic Church in Traverse City, Michigan. He predeceased her December 26, 1998. Regina was a bookkeeper for Mobil and Standard Oil Companies. She was a member of Holy Spirit Catholic Church. Regina was proud to be a shortstop for the champion Maple City High School Softball team. She also enjoyed gardening, bowling, crafts and was an excellent seamstress. Surviving to cherish her memory are many nieces, nephews and special friends especially Nancy Pavlik. Regina was preceded in death by her daughter, Sharon Ann Bailey and ten brothers and sisters. Funeral Liturgy will take place 11:00 a.m. Thursday, April 5, 2018 at Holy Spirit Catholic Church, 1035 N. River Rd, Saginaw. Rev. Fr. David Parsch and Rev. Fr. Peter Gaspeny will officiate. Burial will take place in Old Calvary Cemetery, Midland, Michigan at 2:00 p.m. on Thursday. Friends may visit at The Snow Funeral Home, 3775 N. Center Rd. (between Shattuck and McCarty), where the family will be present on Wednesday from 4:00 p.m. to 8:00 p.m. and at the church on Thursday from 10:00 a.m. until time of Mass. A Vigil Service will take place 7:00 p.m. Thursday at the funeral home. In lieu of flowers, those planning an expression of sympathy may wish to consider memorials to the charity of your choice.